With just 10 days of data we are already seeing patterns in where accidents are happening. 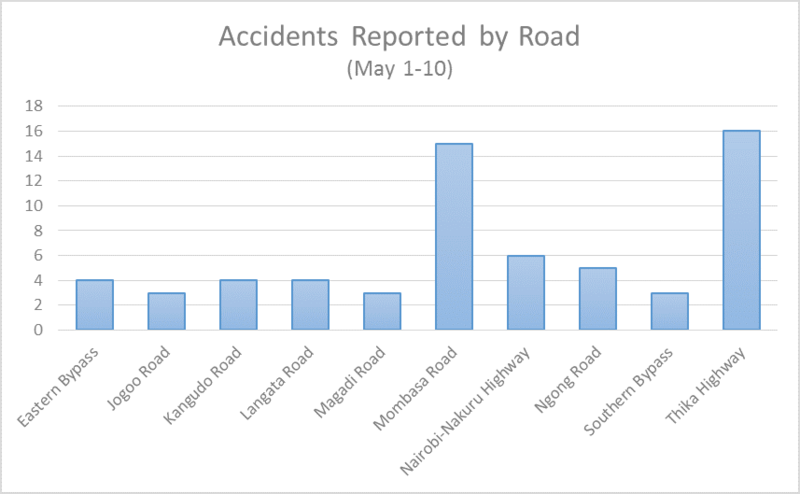 Two roads had the most reported accidents by far – Mombasa Road and Thika Highway. The map below shows individual accidents in their approximate locations. At this point the accidents look almost evenly spread along the road, but we hope that with more data spatial clusters, called “hot spots”, will start to be visible. Identifying these hot spots is a key goal for data analysis since they allow road improvements to be targeted in specific areas. The more details we have about a hot spot – the types of vehicles or other road users (like pedestrians) that are involved in the accident, the time of day most accidents occur at that spot, any weather or other conditions that worsen the likelihood of an accident – the more precise the road improvements can be to fix the hot spot. This is why we hope to gather as many details as possible from multiple Ma3Route reports. This chart shows all of the roads where there were more than 2 reported accidents.